My name is Zarielle A and I am a junior at Granby High School. I have been involved in Y Street for 2 years now and this has been my first year on the Y Street Leadership Team. I feel that tobacco-free school divisions are important because when comparing class averages in test scores between smokers and non-smokers, those who smoke tend to score very low. From this, it is concluded that smoking and tobacco use causes negative effects on our youths academic processing and school participation. As a student, those around me that are tobacco users in my opinion, are pushing themselves down a negative path especially being so young. Tobacco use comes with many health problems, so since we are so young, we can almost “set” a pathway for our health to follow, for those who are tobacco users, to me, are already damaging their health’s future. From personal experience, my parents both used to be heavy tobacco users, so I’ve witnessed the many health problems they went through from tobacco use. It wasn’t until they both stopped smoking that their health became better and they no longer suffer the many health effects they used to have. 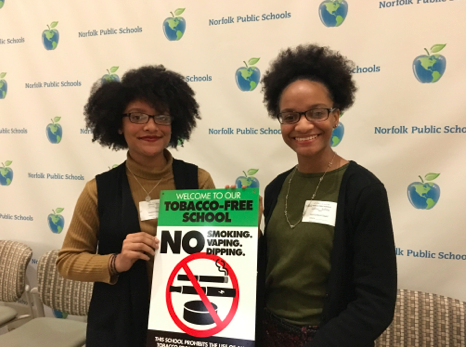 A tobacco-free school impacts a community by not allowing for harmful substances to be used in an area where progress and growth should be made. Also, tobacco-free schools tend to have information available to those who need it; for example, signs, in which the information help to aid the youth and community as to why tobacco use is so harmful. Students are influenced by tobacco-free policies by learning of the many consequences that come with tobacco use on school grounds, being given places they can go to for help if they are already tobacco users, and the benefits of being “informed” or “persuaded” to quit. With school board meetings, principal meetings, signs, information cards, and school held events, Y Streets efforts help schools by thoroughly providing aid, information, and guidance to tobacco users and to the schools in hopes of the students and the school division in becoming 100% tobacco-free. For more information on the 24/7 Campaign, visit 247campaignva.com.